Cotton Tree is a small business, based in Johannesburg, that creates beautiful handcrafted cushions and other decor products with passion. Cotton Tree is about Handmade, Authenticity, Design, Local, Bespoke, Texture, Simplicity, Contemporary, Artisinal, Quality and 100% Cotton. The journey began in 2012, learning to knit and crochet as a form of therapy, which naturally turned into a much loved hobby and eventually evolved into a small business. It is so satisfying to work at something that you love every day! 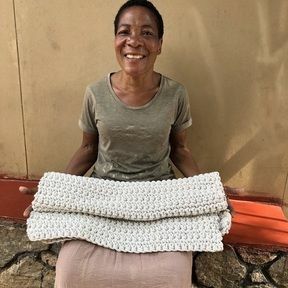 The cushions are hand-knitted and embroidered in South Africa by a group of extremely dedicated women, who pride themselves on delivering a quality, authentic product. I believe strongly in the ability of creativity and working with your hands to fill your soul and bring purpose to your life and in this instance, it provides a means to earn an income at the same time. I found as I scoured Pinterest in the early years for inspiration, that I was constantly drawn to the thicker, chunkier yarns and needles. I love the texture that is created and it allows for a modern, contemporary style and feel. It was also important to me to create something that included my own design and inspiration, hence the range of cross-stitch designs which are hand-embroidered onto the cushions.